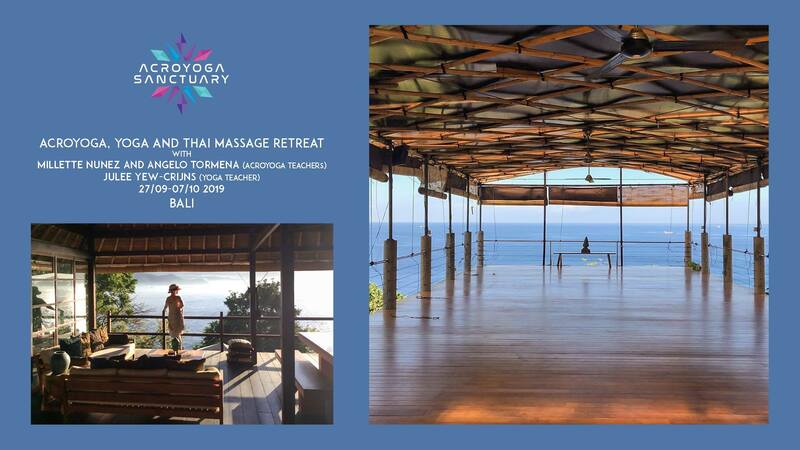 Acroyoga Sanctuary is happy to host a sensational Retreat in Bali. We will have Acroyoga workshops everyday for beginners and intermediates lead by Millette Núñez and Angelo Tormena, Yoga classes every morning lead by the amazing Julee Yew-Crijns and Thai massage classes to finish beautifully each day. A Balinese priest conducts this spiritual ceremony at the beginning of your retreat. Participants dress in temple clothes and receive a blessing of holy water as they give a small basket of flowers as an offering. Full time schedule of the retreat will be available soon. Accomodation in private Villas with the best view and food all inclusive. For more info feel free to get in touch.